Mon., June 23, 2014, 2:15 p.m.
A Cabinet Mountains Wilderness map published in June 2014. TRAILS – A new Cabinet Mountains Wilderness map, featuring about 80 trails, has been published by conservation groups celebrating the 50th anniversary of the Wilderness Act. 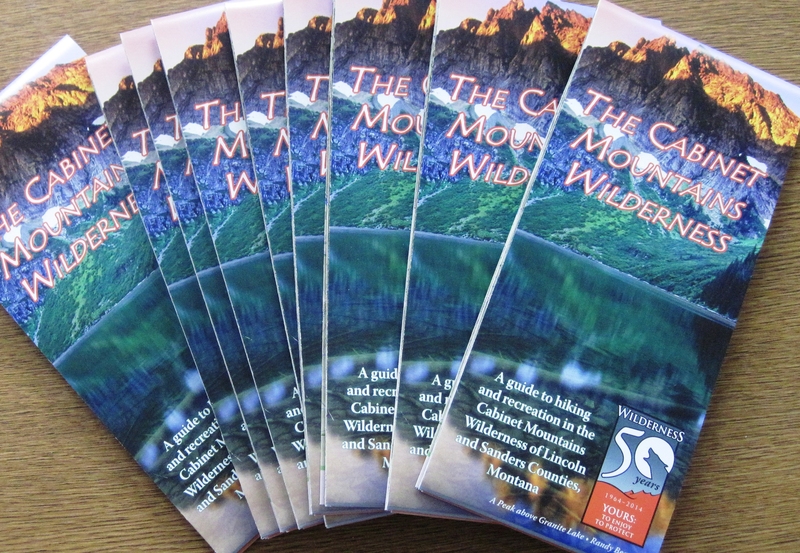 “The last Forest Service wilderness map, published in 1992, is out of print and hard to find,” said Sandy Compton of the Friends of the Scotchman Peaks Wilderness, one of several groups, agencies and businesses that worked on the project. “This is not only a good map as far as being able to find your way around, it’s also more of a resource for the local communities,” he said, noting it lists trails, contacts, attractions and services around the Western Montana wilderness area south of the Kootenai River. Ten trails are featured with short descriptions to show the range of options. It’s illustrated with photos from the area. The new map is clean, easy to read and water-resistant. But mapaholics won’t want to throw away their old Forest Service wilderness map. For example, the new map omits a few landmark names, including small lakes or ponds and Hanging Valley. Perhaps a symptom of climate change, the label for Blackwell Glacier on the north side of Snowshoe Peak is missing; the feature shows as water. However, trails on the new map are updated, easier to follow and more detailed. Released this week, the map is being distributed at Forest Service offices, stores in the region as well as the Spokane REI store. • A free app is available for Android or IOS mobile devices. Download it at avenza.com/pdf-maps, then to wildmontana.org/cabinethikes and download the GeoPDF. FORESTS – The U.S. Forest Service is seeking public comment on a proposal that would help standardize where and when over-snow vehicles, such as snowmobiles, are used on national forests and grasslands. Snowmobiles and other track and ski vehicles are currently treated differently from other off-highway vehicles, which are restricted to routes designated on motorized vehicle use maps. A 2013 court ruling requires the agency to regulate over-snow vehicles, too, but gives officials room for discretion. Comment will be accepted until the end of July with the final rule to be released in early September. • See more details about the proposal on Rich Landers’ Outdoors blog, spokesman.com/outdoors. CYCLING – Mountain bike skills classes with certified coaches are being offered this summer at Camp Sekani by Evergreeneast.org. Classes cover the fundamentals of balance, body positions, cornering, switch backs, obstacles and more. The class for intermediate riders is Wednesday at 5 p.m. The Women’s Basic class is July 9 at 6 p.m.
A freeride class, July 21, covers skills such as advance wheel lifts and drops. Preregister: evergreeneast.org/skillsclasses. SKILLS – The Washington Outdoor Women’s annual fall workshop, for adult women and girls age 9-12, will feature activities such as fishing, hunting and outdoor-skills clinics near North Bend Sept. 12-14. Volunteer instructors will guide the sessions at Camp Waskowitz. Published: June 23, 2014, 2:15 p.m.